When the Mirage Hotel and Casino opened its doors on in 1989, it broke ground in more ways than one. It marked the beginning of a building renaissance on the Strip, becoming the city’s first full-service resort instead of a casino-hotel. The Mirage is centrally located on South Las Vegas Boulevard. 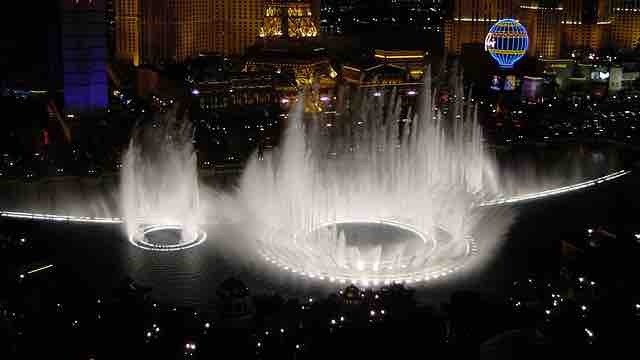 It’s south of the Sands Expo Convention Center and north of Caesars Palace, Flamingo, and Bellagio. The closest monorail station is Harrah’s & The LINQ, approximately a ten-minute walk. Check-in time is 3:00 PM and check-out time is 11:00 AM. Early check-in may be an option for an extra fee, depending on availability. Cirque Du Soleil's trademark blend of music, choreography, and aerial acrobatics soar to new heights with a soundtrack of The Beatles classics. 360-degree seating offers an unrivaled visual experience, while a Grammy-winning soundtrack will be beloved by all ages! Whether your kids are already fans or new to The Beatles, LOVE is great for all levels of fan. Show times are 7:00 PM and 9:30 PM Tuesday through Saturday. America’s Got Talent winner Terry Fator’s accomplishments in comedy, singing, ventriloquism, and celebrity impressions make for a great night of music and hilarity! Backed by a live band and featuring Terry’s original cast of beloved puppet characters like Emma Taylor and Winston The Impersonating Turtle, The VOICE of Entertainment will make all ages laugh and sing along. Show time is 7:00 PM Monday through Thursday. This is a great free activity. 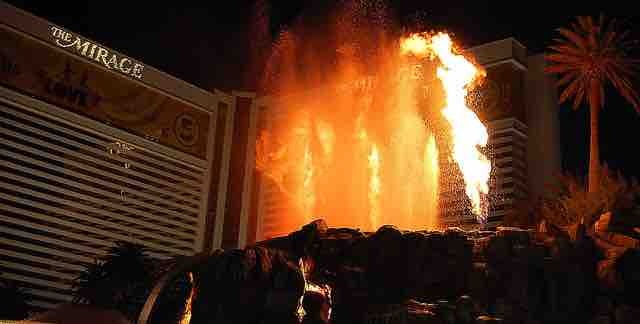 Head outside the Las Vegas Boulevard main entrance to see fire, smoke, and lava erupt right on the Strip! The iconic explosion is set to a new soundtrack by Zakir Hussain and The Grateful Dead’s Mickey Hart. The Volcano erupts daily at 8:00 PM, 9:00 PM, and 10:00 PM. Las Vegas attractions come and go, but Siegfried & Roy's Secret Garden and Dolphin Habitat is one of the most enduring. The world-famous desert oasis has been a fixture at the Mirage since 1990, created by legendary illusionists Siegfried and Roy. Their trademark white lions and tigers live here in peace and comfort, while bottlenose dolphins frolic happily in their aquatic enclosure. This incredible habitat is a unique and unforgettable experience for the whole family, as educational and entertaining as Siegfried & Roy themselves. Siegfried & Roy's Secret Garden and Dolphin Habitat is open daily from 10:00 AM to 5:00 PM. The Mirage’s heated pool is a Las Vegas favorite for good reason: it’s open all year long! The tranquil waterfall and palm trees provide a lush setting for play or relaxation. The whole family can enjoy the main pool, luxuriate in the hot tubs, and customize the poolside experience to their heart’s content. Pool towels and drinking water are complimentary, rafts are available for rent, and life jackets are available upon request. Rent a cabana or reserve some lounge chairs to make it a beach day in the heart of the desert. The Mirage pools are open daily from 9:00 AM to 5:00 PM. A little campy, a little silly, a whole lot of fun! Get “up close and personal” with your favorite celebrities, brought to life as only the world-famous Madame Tussad artisans can do. The museum features film stars, athletes, musicians, beloved fictional figures, and so much more. This exciting Las Vegas attraction is the world's tallest observation wheel and offers an unbeatable view of the city. Standing at an astounding 550 feet tall, it takes the High Roller 30 minutes to complete a full revolution. The wheel houses passengers in climate-controlled glass pods that hold up to 40 people apiece. Beverages are available for purchase. The High Roller is situated on the LINQ Promenade, so there’s plenty to do here even if heights aren’t your family’s thing. This shopping extravaganza is located just south of The Mirage. Approximately 160 shops are on hand to cater to every budget, from the height of luxury to the more every day. The Forum shops are more than just retail, though: the free Fall of Atlantis animatronic show will enchant the whole family. The Mirage does not offer on-site childcare. Who doesn’t love breakfast food at all hours of the day? Pantry, open 24 hours, serves breakfast all day and all night long. A non-breakfast menu is available daily from 11 AM to 11 PM. Both menus are chock full of classic American cuisine, from the Pancake of the Week and Eggs Benedict to New York Strip and Roasted Chicken Breast. There’s plenty here to suit all ages and tastes! Pantry also offers in-room delivery. Pantry is open 24 hours a day. This popular pizza chain is not only a very good choice for families, but also one of the most reasonably-priced restaurants at the Mirage. The well-rounded menu focuses on California-style pizza with 18 specialties to choose from, but there’s also a great selection of small plates and non-pizza choices like pasta and salads. Split a pie with the whole family and enjoy some great fresh Cali flavor! California Pizza Kitchen is open 11:00 AM to 12:00 AM Sunday to Thursday and 11:00 AM to 1:00 AM Friday and Saturday. Kids will have a blast creating their own sundaes from the wide variety of yogurt flavors and fun toppings! Blizz is more than just frozen yogurt: enjoy waffles, crepes, smoothies, and more. Blizz Frozen Yogurt is open 8:00 AM to 10:00 PM Sunday to Thursday and 8:00 AM to 11:00 PM Friday and Saturday. Cravings Buffet is perfect for the family of fussy eaters: there’s something here for everyone! Choose from 11 international cooking stations and tuck in for breakfast, lunch, brunch, or dinner. Some of the options include Italian, American, and Latin. Adults can enjoy unlimited beer and wine, while Coca-Cola aficionados of all ages will enjoy self-serve beverage stations with 150 flavors. Kids 4 and under eat free. Cravings Buffet is open 7:00 AM to 9:00 PM Monday to Friday and 8:00 AM to 9:00 PM Saturday and Sunday. The Mirage participates in MGM’s M Life Rewards program. Members earn points and perks with every dollar spent at participating properties. Is The Mirage Family Friendly? Between the year-round swimming, Secret Garden and Dolphin Habitat, erupting volcano, and family-friendly restaurants and entertainment, the Mirage has plenty to offer for all ages. The room size and lack of free refrigerators may pose an issue for some. The food costs on-site can be a bit pricey, but there are plenty of alternatives nearby! The ideal Strip location and abundance of kid-safe options make the Mirage a great choice for families on a memorable Vegas vacation.